A typical listing provides a lot of information, but how important is that information to car shoppers? 80 percent of consumers lost trust in local businesses if they see incorrect or inconsistent contact details or business names online. In the last 12 months, 71 percent of consumers had a negative experience because of incorrect local business information found online. 68 percent of consumers would stop using a local business if they found incorrect information in online directories. In other words, the more information you have — and the more accurate it is — the more consumers trust a local business and have a better experience online. Following up on this investigation, we leveraged our national network of dealerships to conduct four studies on Google My Business. Note that these dealerships land across a broad spectrum. 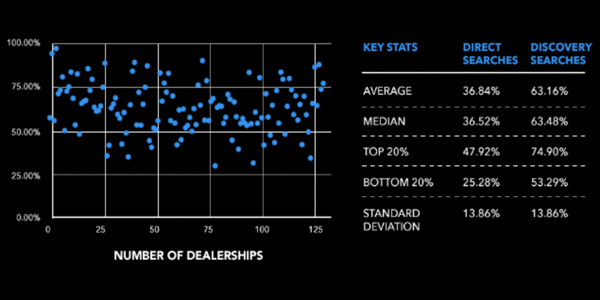 A wide range of results like this gives dealer principals, managers and internet directors perspective on where their dealership fits in and compares. Without that insight, you’ll struggle to set proper goals. Across our network, we calculated a few key statistics to understand the importance of reviews. 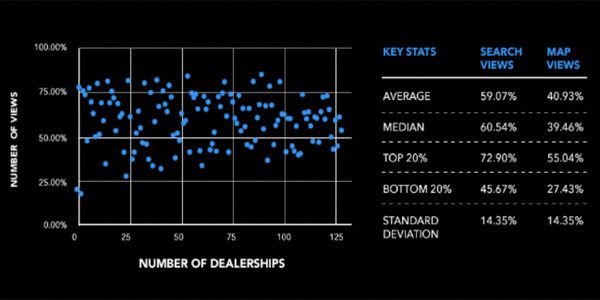 While the median for dealerships was 245 reviews with a 4.4 rating, the top 20 percent had 513 reviews with a 4.6 rating and the bottom 20 percent had 83 reviews with a 4.2 rating. 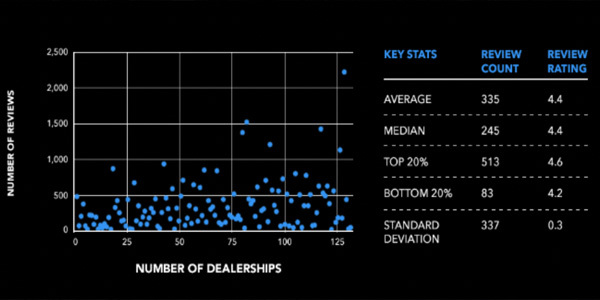 These figures can give you perspective on how many reviews you have compared to other dealers. If you want to improve, you can get a good idea of what the best are doing. According to studies cited by an April 2018 Forbes article, 90 percent of consumers stated that positive online reviews influenced what they bought and 94 percent will buy from a business with a high rating. Considering how important reviews are among consumers, if your local competitors are also acquiring online reviews, it’s vital that you exceed the median 4.4 rating to draw customers away from your competition. 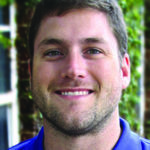 Direct Search: Car shopper types in exact dealership name. Note: There are actually three types of searches, the third being Brand Searches, but these were only launched about one month ago. They aren’t showing up in the API yet, but we will gather data here as soon as Brand Searches are added like we have for Directory and Discovery Searches. Google My Business is all about visibility, so it’s important to understand how well your GMB shows up in search and on the map. This study provides an important reinforcement of the value of map views, considering they account for a high percentage of total GMB visibility. If your SEM provider is not buying map views for obvious in-market shopping queries (using query data), you need to request they begin doing so immediately. We can’t overstate the importance of conversion rates. Google My Business offers several engagement options. Whether it’s getting more eyes on your inventory with the website, directions requests or phone calls, your local car shoppers can engage with you in several ways. Car shoppers do use your GMB to get to your site. There’s a known correlation between having more inventory viewed and more leads submitted. 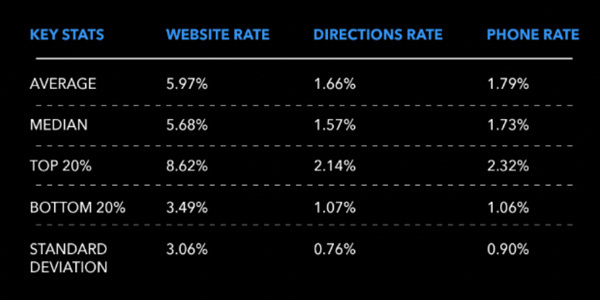 Notice that the Top 20 percent has more than double the website rate than the Bottom 20 percent for contact metrics. More eyeballs see Google My Business pages than dealership websites in some cases, so imagine how effective it would be to double your means of contact on such a page. What could it do for your sales if you have twice as many requests for directions and twice as many phone calls as you do now?